Day of the Dead Stickers, Patches, Keychains and More! Day of the Dead Wallets, Button Boxes, Metal Signs, Tees and Totes! 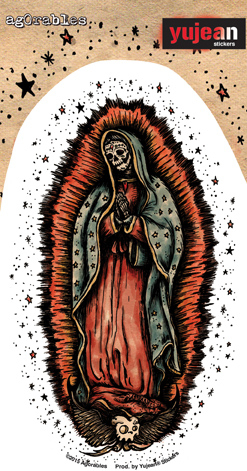 Our Lady of Guadalupe by Agorables. For a Dia de los Muertos mood. Weather resistant, extra-long lasting sticker. Printed on clear backing--great on wondows! 5.5 x 3.25" die cut sticker. Artist: Agorables.